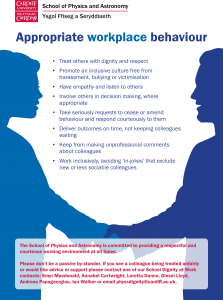 The School of Physics and Astronomy is intended for networking and collaboration as well as work and study. We value the participation of everyone and want all staff, students, visitors and other participants to have an enjoyable and fulfilling experience. Accordingly, all participants are expected to show respect and courtesy to others throughout the School at all times and at all events, whether officially organised or hosted by the School of Physics and Astronomy or not. We would like to make it very clear: the School of Physics and Astronomy does not tolerate harassment of anyone in any form, regardless of gender, sexual orientation, disability, physical appearance, body size, race, nationality, religion. All communication given by staff, students, visitors and other participants should be appropriate for a professional audience including people of many different backgrounds. Sexual language, jokes and imagery is not appropriate for any event. Participants asked to stop any harassing behaviour are expected to comply immediately. Participants violating these rules may be asked to cease participation in the event or activity at the sole discretion of the School. If you are being harassed, notice that someone else is being harassed, or have any other concerns, you should contact your line manager or a member of the Dignity at Work team (Emyr Macdonald, Annabel Cartwright, Loretta Dunne, Glesni Lloyd, Andreas Papageorgiou and Ian Walker) or email physxdignity@cardiff.ac.uk. Please see the Workplace Behaviour posters around the department (available to download in English or Welsh). We hope you have a wonderful time at this school.